Jayapura, Jubi – President of Indonesia, Joko Widodo said began Sunday (05/09/2015), the access of foreign journalists to Papua is to be opened. ‘Starting tomorrow, (Sunday 10/5) for foreign journalists (to) have us open, No problem,” President Jokowi said answering questions from Jubi, on access of foreign journalists to Papua who have been restricted. President Jokowi added that foreign journalists who come to Papua no longer need a special permit, the same as if the journalist was coming to cover other areas in Indonesia. “For foreign journalists no longer a problem. What else? (in) Jakarta need a permit? No, no, no! “Jokowi said firmly. When mentioned about the (Indonesian Ministry of Information) Clearing House that had been limiting the foreign journalists access to Papua, President Jokowi said there will no longer be a Clearing House. When asked again whether as president he believes in his statement, President Jokowi said he was very confident. “I have conveyed to the ranks here. In Papua, the minister, in the TNI Commander, in Chief of Police, has it all. What is lacking?” asked President Jokowi again. Previously, the Alliance of Independent Journalists (AJI) specifically noted, until 2015, the freedom of the press in Papua is still restrained. The Institution (of the) clearing house has been used to restrict access to any foreign journalists who wish to cover in Papua. In fact, every foreign journalist who managed to gain access to cover Papua, often are followed or escorted, doing work that (ensures) journalists are not free in performing their public duties. Local journalists were often intimidated and there even are some cases of murder of journalists. “AJI expressed that restriction of access of journalists in Papua will negatively affect the people of Papua, Indonesia further. Restrictions would encourage the emergence of more sites that are far from the principles of work of journalism that puts the verification and confirmation,” the Chairman of AJI Indonesia, Suwarjono, told a public discussion on Freedom of the Press in Papua, on April 29 at the Parliament press office. According to Suwarjono, information that is circulating through the Internet – which can not be prevented from spreading – could not be verified as journalists also face difficulties in performing duties because of the restrictions. (Giving full) Disclosure access to journalists in Papua will give the public information that is more credible and trustworthy, and also can also be the reliable eyes and ears for Indonesian rule. Translated by WestPapuaMedia, edits in parantheses for linguistic clarity. of the tunnel. This is also openning the door for greater autonomy n may be a full democratic and free destiney for our melanesian brothers and sisters. President Joko Widodo is beginning to take a small but important step in the right direction. and of course, free and unfettered access to ALL areas of Papua, including mining, forestry and resource extraction areas, prisons, and military operations areas . Until these minimum conditions are guaranteed by an actual InPres (Presidential Instruction) in law, with penalties enforced for any official that prevents or ignores it, then this is just a n utterance. Nevertheless, Jokowi did say it, he was interviewed about it, and this was the statement that was made. Whether or not it is really enacted doesn’t take away from the fact that here is a clear undertaking. Of course, letting in foreign journalists who don’t believe the hype (and Mambor is reporting it, not endorsing it), will be the real test. And making sure that the police and military answer critical questions when they kill civilians is part of that, including not hanging up on WPM. Like the State Violence Forces are going to suddenly stop tailing and harming journalists, human rights defenders and media workers. WPM will still operate with great scepticism about anything Jakarta (or any government) ever says, that is the job of journalism. WPM will still need to operate clandestinely, and we will still need support to train and supply people for safe witness journalism. As far as we are concerned, the Media Blackout remains firmly in place. cover when within the inner contents of its fomestic attitude remains much more than being primitive. 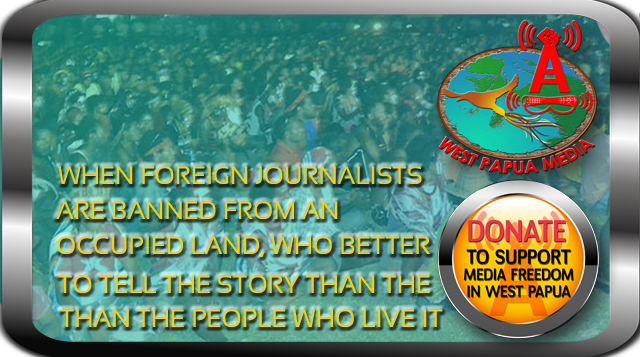 To President Jokowi, the world is watching you saying you allow foreign media to Papua. Words are sometimes being “slip of tongue” but can the “action” be ultimately proven for the benefit of human?